Micromax India, which started out as the go-to company for ‘budget’ mobile phones, has emerged quite positively in the smartphone market. The year 2012 has been very active for the company. With the release of Andro A60, Micromax made its debut in the smartphone landscape. Since then, it has released many remarkable (read: hot-selling) Android smartphones, including the 5 inch screen Micromax Superfone A100 and Canvas 2 A110. Let us trace some of the important points of Micromax’s year in the smartphone market. Micromax had the distinction of rolling out some of the cheapest phones in the market. However, when it comes to smartphones, budget is not a very tight straitjacket. Smartphones are virtually useless, if they can’t multi-task or deliver a wide array of functionalities, it is really of no use. When Micromax launched Andro A60 back in November 2010, not a single person, in his right mind would have thought that by the end of the year 2012, the same company would release powerful phone like A110 Canvas 2 which sold more than rival models from well-known brands like Sony, Samsung and HTC. Each phone that Micromax has released, showed incremental growth. It has reached a stage where the phones have somehow managed to strike a balance between their prices and decency. This has been a notable development for Micromax in the smartphone niche. Phablet market has been on the rise since the release of Samsung Galaxy Note. People have accepted the 7 inch tablet, and the 5 inch smartphones are sort of a second degree refinement on the ‘right’ size for a pocket smart device. 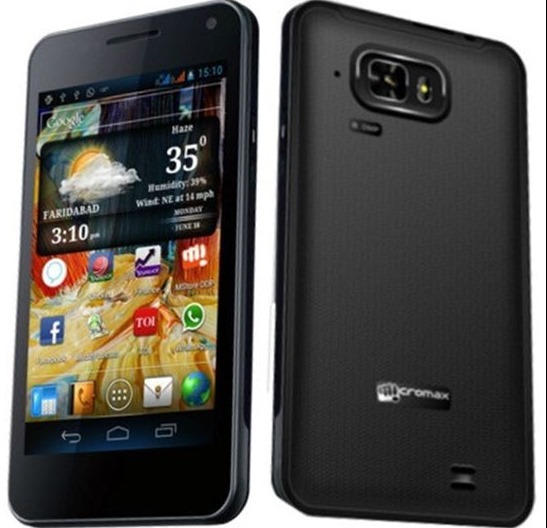 Micromax released the A110 Canvas 2: a 5 inch screen phone, which has all the traits of a phablet. We shall cover A110 Canvas 2 in detail later. If you pick up a Samsung Galaxy smartphone and a Micromax Android based smartphone of nearly the same price range, the first thing that gets noticed is the display quality. Earlier, smartphones from Micromax generally came with sub-par resolution displays. But just last year, they came up with Micromax Superfone Pixel A90, which had Super AMOLED screen with a respectable screen resolution. This year, they announced Micromax Canvas HD A116, again a phablet, with an impressive 1280 x 720 display. It is due this February (infact, pre-bookings have started), but what’s importance is the fact that Micromax has upped the ante for delivering quality displays for smartphones. Now their screens are better than rivals from big brands in the similar price range. The screen used in the Micromax Canvas HD is probably the best screen in its price range with HD resolution and nearly Retina-level 294 ppi pixel density. For the given features (which shall be mentioned shortly), the phone has an outstanding price. A large screen with a wide enough viewing angle, above average battery life and fluid performance are just the opening statements for describing how good the phone is. In many instances, it has even drawn comparisons with Samsung Galaxy Note II! 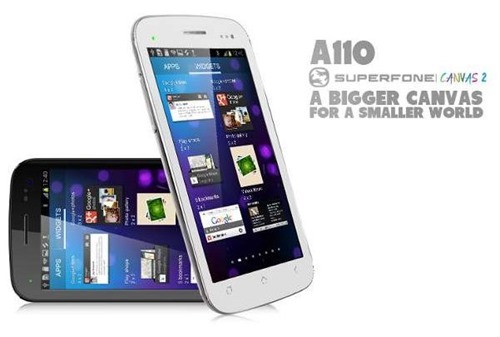 A110 Canvas 2 had a predecessor, and interestingly, this phone has been priced at the same price, with added features. The hardware looks good, works well (1 GHz dual core processor from MediaTek; MT6577 with PowerVR SGX531 GPU) and has a lot of real estate on the screen. There is an 8MP autofocus camera with LED flash and HD video recording with continuous autofocus as well. The pixel count isn’t very high (800 x 480 pixels) though but it still manages to give good enough picture. Canvas 2 is undoubtedly among the best phones in Micromax’s arsenal. The Micromax Canvas 2 price is around INR 10K and in that price segment, the best Samsung device is may be Samsung Galaxy Ace and it is miles away from its Micromax rival. As I keep in touch with a lot of offline retailers in the city, I have heard from them that this phone is out-selling the flagship phones from Samsung which is quite a statement! A90S comes with a dual core processor and interestingly priced at around INR 10K. It has a screen size of around 4.3 inch size with resolution of 800 x 480 pixels, 1 GHz dual-core processor (MediaTek MT6577) and PowerVR SGX 531 GPU. 512 MB RAM and 4 GB internal memory are pretty decent on the storage and multitasking front. There is an 8MP autofocus camera with LED flash and HD video recording with continuous autofocus as well. Battery of 1600 mAh is quite decent too. While A90S doesn’t have a strong appeal like A110, it is still among the best phones that Micromax has launched in this year. Micromax has also launched many dual-SIM smartphones in the entry-level category too. A78 had a good run as a dual SIM smartphone and among other releases, Micromax Bling Q55’s successor, Bling 2 was launched in May of 2012. Its flashy looks didn’t make much impact, probably because of the accompanying older Android 2.2 Froyo operating system. But one thing that is driving away potential consumers from Micromax is their stint with operating system upgrades for released devices. Not even a single phone which was released last year has ever got a software upgrade – which is essentially one of the most important things about a smartphone these days. Apart from that single failure in providing OS upgrades, Micromax has improved considerably in the span of one year, be it features, hardware quality or value for money factor. Many of its products have failed, but those which have come through have been very successful by industry standards. The journey from the rebranded Andro A60 to a massive selling Canvas 2 A110 has been swift and full of surprises for the customers. The company has surely got more to offer in the coming years. "Micromax’s Smart Rise over Past 12 months [Overview]", 5 out of 5 based on 1 ratings. SC orders Telenor & Systema to Shutdown services Immediately!